Making the correct decision on storage investment is critical. Organizations must have enough storage performance and agility to innovate when they need to implement cloud-based IT services, deploy virtual desktop infrastructure, enhance fraud detection, and use new analytics capabilities. At the same time, future storage investments must lower IT infrastructure costs while helping organizations to derive the greatest possible value from their data assets. The IBM® FlashSystem V9000 is the premier, fully integrated, Tier 1, all-flash offering from IBM. It has changed the economics of today's data center by eliminating storage bottlenecks. Its software-defined storage features simplify data management, improve data security, and preserve your investments in storage. The IBM FlashSystem® V9000 SAS expansion enclosures provide new tiering options with read-intensive SSDs or nearline SAS HDDs. 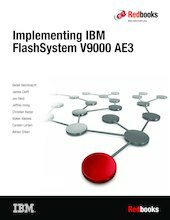 This IBM Redbooks® publication provides information about IBM FlashSystem V9000 Software V8.1. It describes the core product architecture, software, hardware, and implementation, and provides hints and tips. Using IBM FlashSystem V9000 software functions, management tools, and interoperability combines the performance of IBM FlashSystem architecture with the advanced functions of software-defined storage to deliver performance, efficiency, and functions that meet the needs of enterprise workloads that demand IBM MicroLatency® response time.